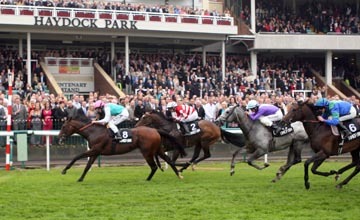 Haydock’s feature race on Saturday is the Timeform Jury Stakes, a Group 3 event registered as The John Of Gaunt Stakes. It is a seven furlong race for four-year-olds and upwards and has been won by some high quality horses in the past including Main Aim and Decorated Hero. Pastoral Player won the race in 2012 under a masterful ride from Darryl Holland and Hughie Morrison’s six-year-old is back again this year, this time with Graham Lee in the saddle. He shaped most encouragingly over the course and distance last month in a race that could hold the key to Saturday’s renewal. The Pertemps Network Spring Trophy was won by Eton Forever by a head from Gregorian with Red Jazz third and Pastoral Player in fourth. The runner-up has since gone on to win the Diomed Stakes at Epsom with the fifth and sixth horses also running well subsequently. The going was good to soft on that occasion and will ride faster on Saturday. The faster ground could be a concern for Eton Forever who has shown his best form on good or good to soft ground. Red Jazz disappointed in this race 12 months ago, finishing only fourth when sent off odds-on favourite. His recent effort was his first since returning from a spell in Dubai so he could strip fitter this season. Amarillo is an interesting raider from Germany who finished fourth in a Group 3 race over a mile at Baden Baden last month. He finished runner-up in the German 2000 Guineas last year to Caspar Netscher and holds third-placed Red Duke on that form. Richard Hannon saddles Libranno who pulled too hard for his own good in the Lockinge Stakes at Newbury last time out. That run is best ignored and he is not without a chance if returning to his best. Premio Loco is a regular in this type of race whilst Monsieur Chevalier’s best form is over shorter distances. A strong supporting card also features the Group 3 Pinnacle Stakes for fillies over a mile and three furlongs. Amarillo’s stable companion Nymphea holds a major chance having finished second in the German Oaks last season. She is opposed by Godolphin’s Prussian who was second in a Group 2 at Meydan last time out. The Listed Sandy Lane Stakes looks like an ideal opportunity for Richard Hannon’s The Professor to follow up his comfortable victory at Ascot. Irish raider Clancy Avenue may give him most to do in a competitive event. Check out the latest prices for Haydock at Bet365.